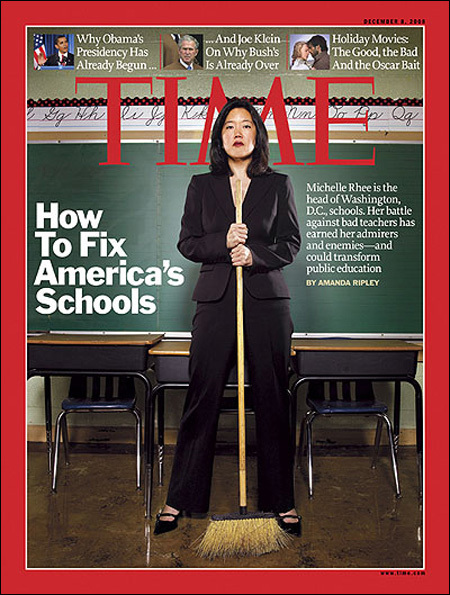 Look who's on the cover of the latest issue of TIME: D.C. school chief Michelle Rhee, who's unconventional, sometimes controversial approach to school reformwhich has earned her both admirers and enemiescould transform public education: Can She Save Our Schools? Love or hate her (there are plenty on both sides) Michelle Rhee became one of the most important names in American public education when she was appointed chancellor of the District of Columbia Public Schools system in June 2007. The article is a really interesting profile on her, her lofty goals, and the crazy changes she's made so far. So crazy, they might just work.